Who says cyclists are nothing but trouble on the road? Besides lessening gridlock and reducing greenhouse gasses, they can also do good for those in need. 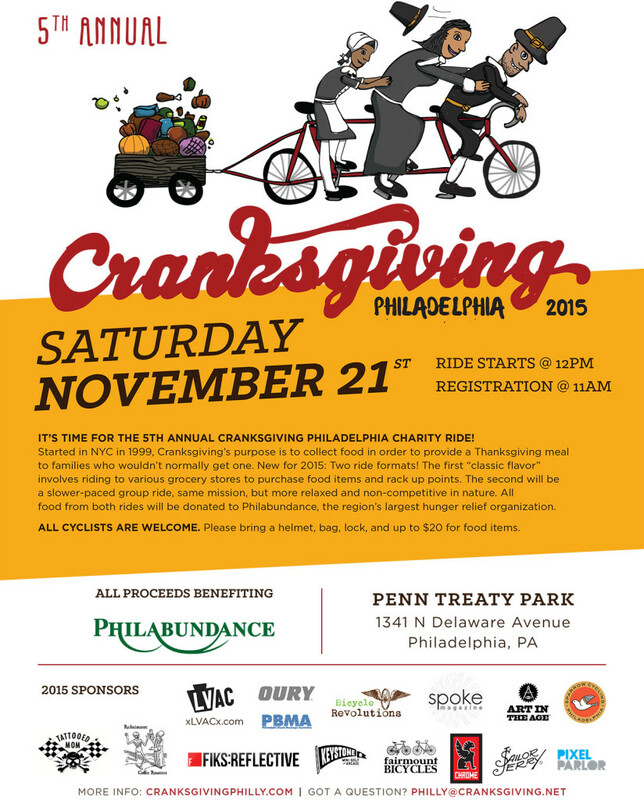 On Saturday November 21st, Philly will see the 5th annual Cranksgiving Ride roll through the streets, all for the benefit of those who could use a good meal this holiday season. The race which started in New York City in 1999 has been going strong in Philly since 2011. Since then it has raised $4,200 and donated 3,692 pounds of food to Philabundance which helps feed around 90,000 people in the Delaware Valley every week. Each year, riders make several stops where they purchase food with their own funds. This year’s ride will begin at Penn Treaty Park at noon. Organizers encourage participants to bring the usual riding essentials: a helmet, a lock, $15 to $20 for food purchases, something to carry their donations in and, of course, a bicycle. Last year’s ride saw 100 riders cover a 25-mile route which had seven stops along the way before ending, as these rides usually do, at Tattooed Mom on South Street. This popular dive has been a major contributor over the years, generously matching funds of the riders’ donations each year. Other major sponsors this year include Chrome, Fairmount Bicycles, and the Philadelphia Bicycle Messenger Association. Whole Foods is also participating for the second time. Last year they matched riders’ purchases and donated an additional 702 pounds of food. The ride begins at noon. Organizers are asking people to get to Penn Treaty Park at 11am to sign up to receive their numbers and manifests. If you show up at noon, you’re probably going to miss the start — so get there early and have a happy Cranksgiving!